Welcome to the seventh Hanko Music Course! The Hanko Music Course will take place in Hanko on 14th – 19th of July 2017. The Course program includes high-quality private lessons and group lessons. In addition the Course offers pleasant free time activities and musical experiences at the festival´s concerts. There’s no age limit (except singing lessons 15 years). There will be suitable chamber music lessons for every student. 12 year old or younger students are warmly welcome with their parents. The Music Course program includes daily private lessons (5 x 45 min), group lessons every other day and free time activities. The lessons are held in Finnish, Swedish and English. Group lessons will also be arranged for students who can’t yet read sheet music. This year it is possible to get instruction in the following instruments: piano, violin, cello, guitar, flute and vocals. 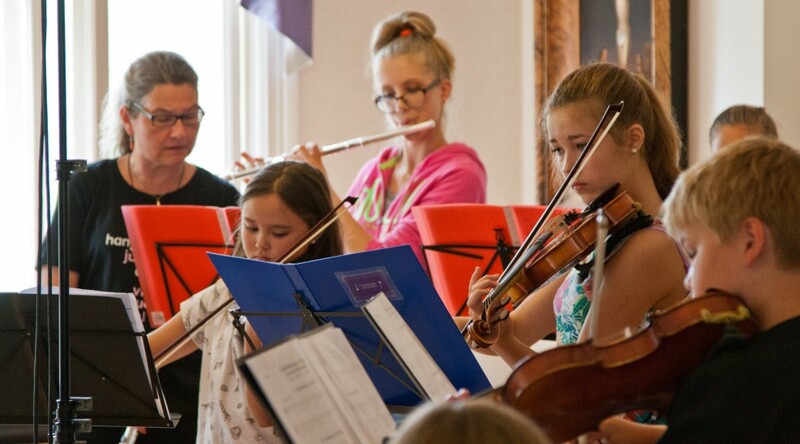 Students who play other instruments are also warmly welcome to the Course for the chamber music lessons. The Course also includes Emmanuel Tjeknavorian’s violin masterclass as well as Emmanuel Tjeknavorian´s and Maximilian Kromer´s chamber music masterclass on the 17th – 18th of July (in English). There are plenty of performing opportunities for the students. The closing concert will be held at the Hanko town hall on Friday, 15th of July. Emmanuel Tjeknavorian’s masterclass in violin will be held on 17th–18th of July. It is also possible to participate as a passive student. The masterclass will be open to public. Emmanuel Tjeknavorian’s and Maximilian Kromer´s masterclass in chamber music will be held on 17th–18th of July. It is also possible to participate as a passive student free of charge. The masterclass will be open to public. In summer 2017, Hanko Music Course students have a unique opportunity to attend a jazz improvisation workshop with Severi Pyysalo, one of the leading vibraphonists in Finland and in the world. The workshop is open to public and course students can participate as active students without an additional fee. ”Improvisation means the ability to be in three places at once: you have to know what has already happened, what you’re doing now and simultanously you need to anticipate what MIGHT happen next. Reacting to your surroundings is essential. This, if you’re playing in a group. The more musicians, the more challening it gets. When improvising alone, the challenge is to come up with something interesting for the whole duration of the performance. But the previously mentioned “trinity” still applies. Often one hears that improvising means randomly playing any notes in any tempo. You can do that as well, but whether that is interesting is another matter. I think that is like listening to a bar conversation: everybody is talking on top of another with different languages, not really listening to each other. It is advantageous to master the traditions of this musical conversation. By listening and mimicking one learns, like in other aspects in life. The absolute pitch hearing is not a necessity, but grasping the relationships between chords, melody and harmony is a great advantage. Skilled improvisation needs practice and the ability to quickly adjust to the new and suprising. But the most important thing is to make the companion sound as good as possible. Come and get acquainted to the wonderful world of improvisation! You do not have to prepare for the jazz improvisation workshop in any special way and there is no age limit (though we recommend minimim ~6 years old). Two student groups will be formed (beginner and advanced) and all students’ level is considered. You will bring your own instrument (there is piano at location). You will play together with other students and Severi. All instruments and singing is welcome. Jazz improvisation workshop is included without additional fee for all students of the music course. You can attend as an active student or as a passive student (open for audience). The length is 1,5 hours per group. The lessons and accommodation will take place at Haagapuisto school. The best beaches of Hanko and the concert venues are all located near Haagapuisto school. We will accept the students in the registration order. The students of the masterclass will be selected by application. We will e-mail you the invoice. You can cancel your attendance in force majeure situations in which case the course fee will be returned with the exception of a 50 € service fee. The final day for the course registration is May 31st. Welcome to Hanko Music Festival 2016!